It sure is getting warm around here! The recent seasonal release of Ghost has us pretty excited here at Dizzy Pig. It’s also a great reminder of how important chiles are to the culinary world as well as to our products. Whether you spell it chili, chilie, chilli, or chile, these peppers are not only nutritious, they are packed with flavor. Some are hot and some are mild, but most of them have at least a little heat depending on the amount of Capsaicin they contain. There are thousands of chile varieties in the world. However, we will limit this post to the top ten chiles that are used in our products, from mildest to hot. As a testament to chiles’ versatility, it is important to note that all of our small batch craft seasonings, with the exception of our Happy Nancy, contains some form of chile. Did you know that paprika is a chile? Actually, there isn’t a chili called paprika – it is a combination of ripe, dried and ground chiles, such as bell pepper, tomato pepper and other sweet peppers. It has been around for a long time, and for good reason too. It has a wonderful flavor that is a little tangy, slightly sweet, and quite earthy with hints of tea and berries. The color ain’t too shabby either. The Spanish Paprika we depend on here at Dizzy Pig has a bright red to red orange color. You may have tried Guajillo (pronounced gwä’he yo), and not realized it. It is a very common ingredient in Mexican cuisine – in salsas, marinades and spice rubs. Made from dried Mirasol pepper, it sports a fruity, slightly tart, and gently smoky flavor, but mild enough to not overwhelm fish or chicken. We find both the heat level and the flavor to be complex, but not in-your-face kind of way. It’s a wonderful ingredient for both flavor and mild heat. Chipotle is such a delicious ingredient that they even named a restaurant chain after it! Cherished in Mexican and Tex-Mex cuisines, this tasty concoction is made by drying and smoking ripened red Jalapeño chiles. The flavor is quite earthy and mildly smoky – adding richness and a splash of mild heat which naturally compliments grilled foods. And there is just enough heat to get your attention! 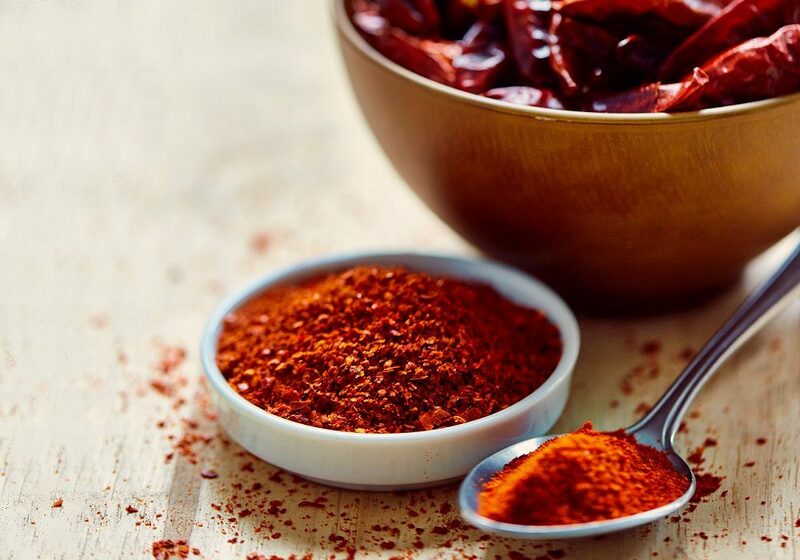 With a long list of health benefits, cayenne is considered by many to be the healthiest spice in the world. The list of uses for cayenne is also long because it is such a versatile spice. The heat is definitely present, but not over powering. The flavor is very mild with floral and hay notes, making it perfect for adding heat but not radically altering the flavor of the food. Aji Amarillo translates to “Yellow Pepper”, and this delicious chile is quite popular in the cuisines of Peru and Bolivia. As one of the main ingredients in our Peruvian-ish seasoning, it provides a very tasty fruity flavor with hints of mango, passion fruit and dried berries. Sometimes referred to as “the chile that tastes like sunshine”, we find that to be an accurate description. Similar to the heat level of Cayenne, Aji Amarillo provides a lot of flavor bang with very little heat. You most likely have seen this ingredient provided as a pizza condiment alongside parmesan cheese, but it has many uses. As the name implies, it is made from hot dried red peppers. But did you know that it comes from more than one type of chile? This concoction consists of many chiles, like red bell peppers, cayenne peppers, and other dried red peppers. There is usually a high ratio of seeds to take the heat level of this flavorful ingredient up a notch. The flavor is familiar to most and the heat is moderate, but definitely quite noticeable, especially on the back end. New Mexico Chiles are one of our favorite chiles to use here at Dizzy Pig. These are “modern” peppers, developed at the New Mexico University in the late 1800s, and grown in the Hatch Valley of New Mexico (often called the chile pepper capital of the world). They are useful in both green and ripened states. The flavor is sharper when green. But when ripened to red, the flavor mellows and the front heat becomes more of a back heat. There are many varieties, but we use ripened chiles with a mildly warm 30,000 SHU here at Dizzy Pig. The flavor is earthy and reminiscent of tea and dried cherries, and the mild heat comes in gently and slowly on the back end. We use this chile more for flavor than for heat. As their seeds are often spread by birds, this chile also goes by the name Birds Eye Pepper. It grows throughout Africa, and commercially in Australia as well. It packs quite a punch, so we use it more for heat, but still enjoy the flavor it provides. The flavor of this chile is very mildly fruity, with notes of citrus, herbs and hay. The heat builds quickly in your mouth and could even leave you with some sweaty brow! Habanero chiles are gaining in popularity. Here at Dizzy Pig, we value their powerful heat, and especially love the intense fruity flavor that leads the way. Habaneros were the hottest chili in the world around the turn of this century, but they have since been dwarfed by other varieties. There are new varieties of Habanero that have little or no heat but still pack the great fruity and floral flavor, like the Habanada Pepper. It will be fun to watch as new varieties of this delicious chile are created. The Habanero we use at Dizzy Pig is between 120,000 and 140,000 SHU. Grown in Northeast India, the Ghost Chile (Bhut jolokia) was deemed the hottest pepper known in 2007 and it is hot, hot, hot! We received a sample of some smoked Ghost Chiles and fell in love immediately. The fruity sweet flavor right up front is impossible to ignore, at least until the heat hits you! The fact that we could use such a flavorful pepper and get enough heat to make true chili-heads happy made it an easy decision to create our seasonal Ghost chiles seasoning. There are diehard chile-heads out there that think a Ghost chile is not hot enough, so growers have been quite busy trying to outdo the rest. These days a hotter variety comes out almost every year, and 3 million Scoville units has been topped. How far can they go? From paprika to ghost chiles, we take advantage of several different chiles to make Dizzy Pig the most flavorful seasonings on the planet. Flavor and heat are not the only benefit of chiles, though. Packed with vitamins, antioxidants, they have anti-inflammatory properties, are anti-allergens, and support a healthy digestive tract too.